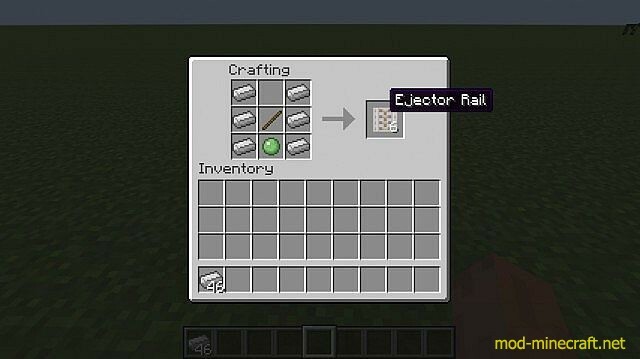 This adds a new rail that will eject any passengers from a minecart that passes over it while it’s powered by redstone. It’s just a knockoff of the new 1.8 activator rail. bjbinc was originally going to just modify the existing activator rail to have this added functionality, but it ended up being more difficult that bjbinc thought, so bjbinc just went with this. The new rail shares its texture with the default activator rail because bjbinc wanted it to be skinned by resource packs. Currently, it doesn’t have a ?powered? texture, but bjbinc’ll be working on getting that added in an update. bjbinc is not in love with the crafting recipe?slime balls seem to be both sticky and bouncy (in the 1.8 update anyway), so bjbinc just went with it. Feel free to offer any suggestions for a different recipe.